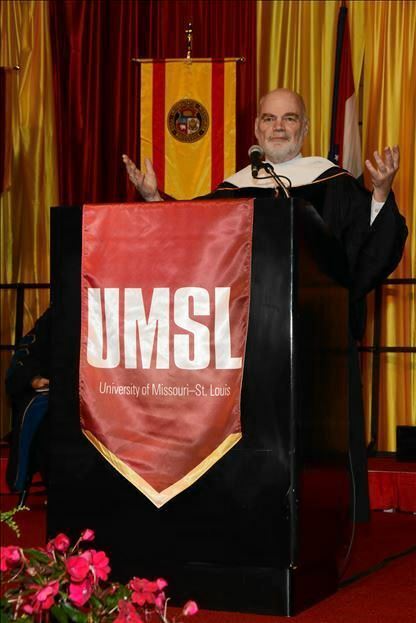 About - Thomas R. Hoerr, Ph.D.
Tom speaking at the UM-St. Louis College of Education graduation ceremony. Tom Hoerr led schools for 37 years and is now a Scholar In Residence at the University of Missouri-St. Louis, where he teaches prospective principals. Tom began as a teacher and then moved into a leadership role as a principal in the School District of University City. He worked with the Pershing School faculty to achieve significant improvements in student performance at the same time that the school population became more impoverished. In 1981, Tom became the head of the New City School in St. Louis, a school founded on a commitment to progressive learning and respect for human diversity. Under his leadership, New City began implementing the theory of multiple intelligences (MI) in 1988 and created the world’s first MI Library in 2006. New City hosted four MI conferences attended by hundreds of educators, and produced two MI books of lessons and articles. During Tom’s 34 years at New City, the school raised funds to renovate the building, expand the campus, refurbish the theater, build the MI library, and establish an endowment for need-based financial aid. He was given Emeritus status when he retired in 2015. Tom has led the ISACS (Independent Schools Association of the Central States) New Heads Network since its inception in 2010. This program for new heads of independent schools, focuses on leadership skills, faculty collegiality, and school governance. He also designed and led the Washington University Program in Non-Profit Management. 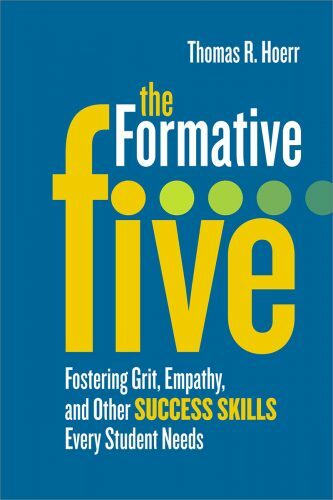 Tom has written five books – The Formative Five: Fostering Grit, Empathy, and Other Success Skills Every Student Needs; Becoming a Multiple Intelligences School; The Art of School Leadership; School Leadership for the Future; and Fostering Grit: How do I prepare my students for the real world? – and more than 120 articles or book chapters. He has been the author of “The Principal Connection” column in Educational Leadership since 2004. He has given presentations at conferences and schools throughout the U.S., and in Argentina, Australia, Canada, Chile, Denmark, Great Britain, Hong Kong, Mexico, New Zealand, and Singapore. He will be presenting in Dubai and the Philippines in the fall. His topics include the Formative Five, grit, faculty collegiality, leadership, multiple intelligences, school culture, and school governance. Tom has also worked with independent schools on governance issues and planning. Tom has led the ASCD Professional Interest Community’s MI Network for twenty years. He publishes a half-dozen MI newsletters each year, featuring articles by practitioners and ideas for implementation. Fill out the form below if you would like to be added to the e-list. You can contact Tom at trhoerr@newcityschool.org. Tom holds a PhD in Educational Planning and Policy-Development from Washington University in St. Louis, an MEd in Educational Administration from the University of Missouri-St. Louis, and a BA in Education from Harris Teachers College. Watch below to hear touching stories from the teachers and students of New City School.